This article was written by John Duggan and originally appeared in Cascade Courier in February 2009. You are on your daily commute or Saturday morning ride, when your worst nightmare becomes a reality—a negligent driver suddenly turns left in front of you. After the impact you realize that you are OK—with the exception of some road rash—but then you discover that your carbon fiber bike has been split into several pieces. How are you going to handle the property damage claim? Generally, the at-fault motorist is obliged to put you back in the same position you were in prior to the crash. If the cost to repair your bike is greater than the market value, then the driver's insurance provider is on the hook to pay you the market value of your bike. If the cost of the repairs is less than the market value, then the repair cost must be paid. From treasure to rubble, this once nice Pinarello Dogma didn’t make the weight against its opponent, a 4,000-pound vehicle. Over the past 10 years, I have handled hundreds of property damage claims. I found a common thread—most insurance adjusters are used to dealing with motor vehicle claims and have little-to-no experience handling bicycle damage claims. Usually, an adjuster does not know the difference between a Pinarello Dogma and a Walmart special. In order to recover your losses, do your homework and be prepared to educate the adjuster. I almost always assume that the bicycle is a total loss. 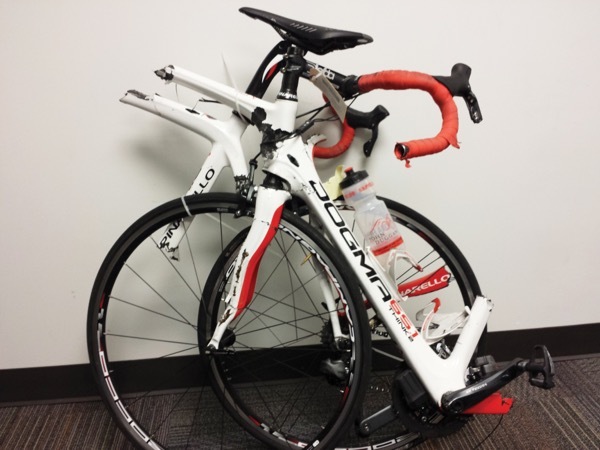 A 15–20 pound bike is not designed to withstand the impact of a 4,000-pound vehicle. In the above example, the carbon fiber frame broke into several pieces and was obviously totaled. In many cases, the damages are not so obvious and may not manifest until much later. The first time I was in a similar crash, I thought my bike was OK, until 10 weeks later when both fork legs snapped off about two inches below the fork crown. The legs suffered tiny microscopic fissures, invisible to the naked eye. Most of my clients are surprised to learn the insurance company is not obligated to buy them a brand new bike. Keep in mind if your 2001 Ford Taurus is totaled in a crash, the insurance company is not required to buy you a 2014 Ford Taurus. You will instead be reimbursed for the market value of your vehicle prior to the crash. Market value is what a willing buyer will pay a willing seller in an arm’s-length transaction. Websites like Craigslist.org, eBay.com, and Bikepedia.com, and a reputable bike shop can help you establish market value. In addition to the bicycle’s damage, you should document (with photographs, receipts and website data) the cost and damage to your accessories (i.e. helmet, glasses, clothing, shoes, etc.). You should be compensated for anything that has been torn, scratched or bloodied. Even if your helmet appears alright, most manufacturers recommend that it should be replaced if it has been involved in a crash. For accessories, the insurance company will often argue that they are entitled to depreciate the original cost. A five to ten percent per year depreciation rate is fair. If the insurance company totals your bike, it is entitled to take possession of it in return for a settlement check. My experience is that most insurance companies do not want to deal with collecting the damaged bike and will usually allow you to keep it. If they demand the damaged bike, you can usually negotiate to buy the totaled bike back for a nominal amount ($50–$100). Even if the bike is totaled, you should be able to salvage enough usable parts like the derailleur, bottom bracket, hubs, brake calipers and bottle cages, to be worth it. Because of the potential for hidden damage, you should probably dispose of the frame, fork, bars, seat post, cranks and pedals. You may also be entitled to recover loss of use damages as part of your total compensation. Loss of use damages are similar to reimbursement for rental car expenses, and are recoverable regardless of whether you use your bike for business, commuting, or simply for pleasure. Furthermore, you are not required to actually rent a replacement bike in order to recover loss of use damages. These damages are recoverable for the reasonable period of time involved in the repair or replacement of your bike. This period starts when you supply the insurance adjuster with all of your documentation and ends with payment to you from the insurance adjuster. Consult your local shop and find out what it charges to rent the same or equivalent bike on a daily/weekly basis. Use these rates to document and establish your loss of use claim. Assuming the car that hit you did not carry liability insurance, or that you were at fault for causing the crash, you may want to look to your own homeowner's insurance policy or renter's insurance policy for recovery. The downside of this approach may be a high deductible and the effect that such a claim may have on your insurance rates. I do not recommend using your homeowner's insurance unless you are dealing with a substantial loss. An advantage of using it, however, is that this coverage commonly pays for a brand new bike, rather than the market value of your bicycle. If you find yourself in the unfortunate position of having to make a property damage claim, do your homework and document all of your damages so that you can properly educate the insurance adjuster and recover your losses.